2 by 3 Heroes: Dime Boxing. Today was the bi-ish weekly card show that I attend about 40 min from my house. I don't get there often enough, but I really wanted to go today. And my wife wanted to tag along, mainly to go shopping after, and I won't complain about that. At the end of a day with breakfast, a card show, lunch, a few stores of shopping and a whole lot of us acting stupid between it all, it was great fun. But enough swooning about my lovely wife, you wanna see the goods, don't ya? So like the title reads, this is mostly dime box pulls. There are a couple things I won't show, like the Jason Bay mini relic I pulled from a pack of Lineage (up for trade), or a couple vintage cards I bought (70 Aparicio and a 68 blue back Bill Freehan). Those two vintage, plus a couple other cards I'll share later set me back $20, but I think I did okay. First, though, let's see what $6 spent on the dime box garnered me. Can you do the math to guess how many cards I got? 60, alright? Will you untie my parents NOW? 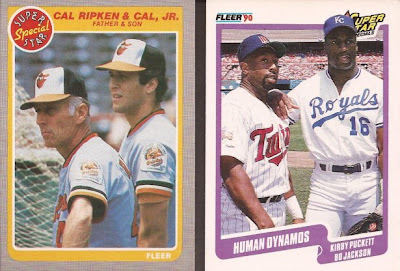 We only had time to hit one dime box, but it was pretty good for 10 cents a card. 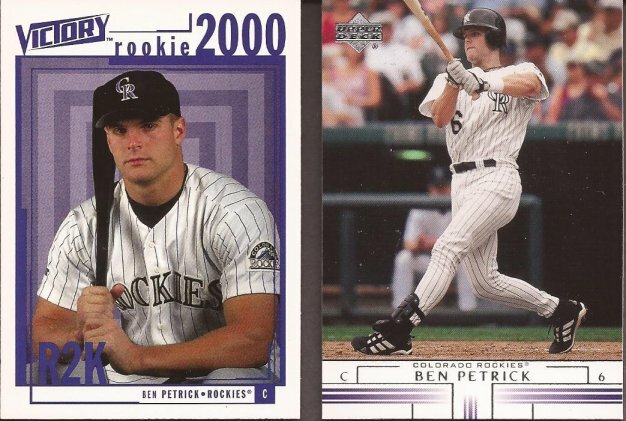 For starters, I ended up finding two cards for my Ben Petrick PC. 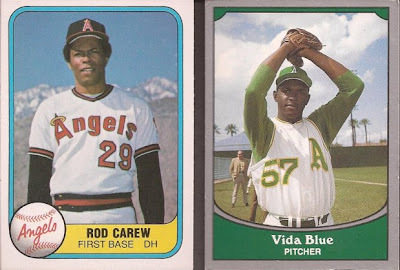 Found a couple very nice cards from the early 80's that were photos from Spring Training. How frigging huge are those A's numbers? Now, I just pull and collect what I like. In that vein, I am not a Randy Johnson collector, but when you see a card like this (from a Pinnacle set called Zenith) for a dime, you buy it. I shared on one edition of SIL of a card from the 2000 Fleer Great of the Game set. 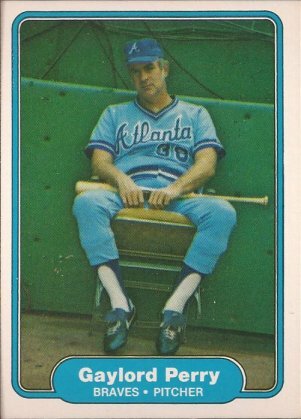 I found a dozen in the box, so I will work on getting the complete 108 card set. Isn't this a pretty card? Out of the 60 cards I have two that mention both players pictured. And nice cards they are. Father/son of the Ripkens, and Kirby with Bo. I think they spotted a couple hotties in the stands. So, my two big purchases (that my wife egged me on to buy). 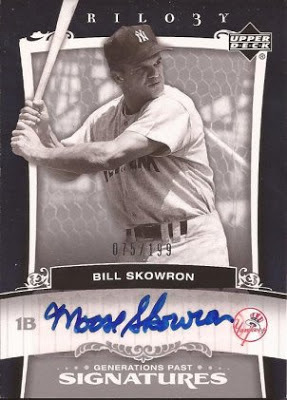 First, I bought this nice auto of the recently passed Moose Skowron. 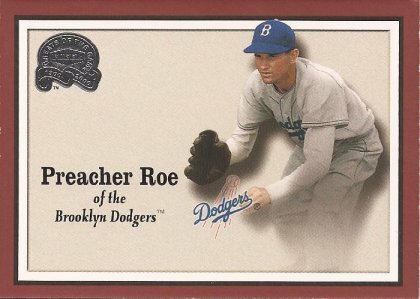 Numbered 75 of 199. It was marked $20, but I got it for $10. Maybe I overpaid a little, but look at what the other half of the Jackson got me. And we now have 10 cards in the Pierce Project. 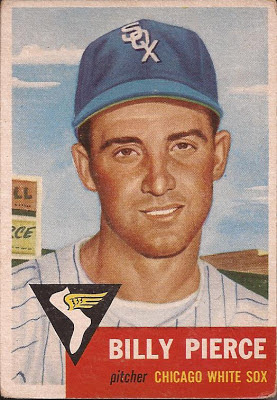 The corners are rounded a bit, but otherwise the card is very clean with no creases. Well, that's it. A good time spent at the show. Got some great cards for the binders. So I am going to sign off here and I will not be talking about any more cards that I got out of the dime boxes. Yup - not going to make mention about any of the other 60 cards that my wife and I found. Don't be so sad, Gaylord. You'll find somewhere else to hide the Vaseline. Nice dime box finds! 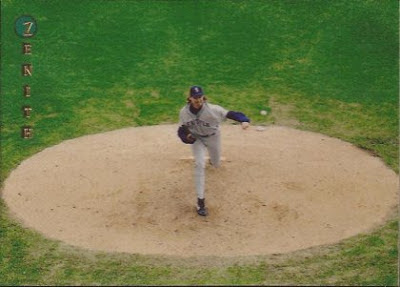 That "Big Unit" card is unbelievably awesome. Love the "Moose" auto as well. Nice pick ups in the dime box. I also like the Moose auto and that Pierce card looks great - vivid colors and nice condition. Very cool cards. I need that Preacher card.